Many of my favorite anime titles involve spiritual elements. The Hayao Miyazaki films, such as My Neighbor Tototor and Princess Mononoke, were greatly inspired by animistic beliefs native to Japan. The interaction between the human and spirit world are important elements to the stories, and I find a lot to compare to Druidism – old and new. Someone online suggested to my husband that we check out A Letter to Momo. While watching the preview, we couldn’t help but compare it to Miyazaki’s style. It wasn’t just the whimsical art or the coming of age story – it was the thin line between this world and the next. We had to watch it. 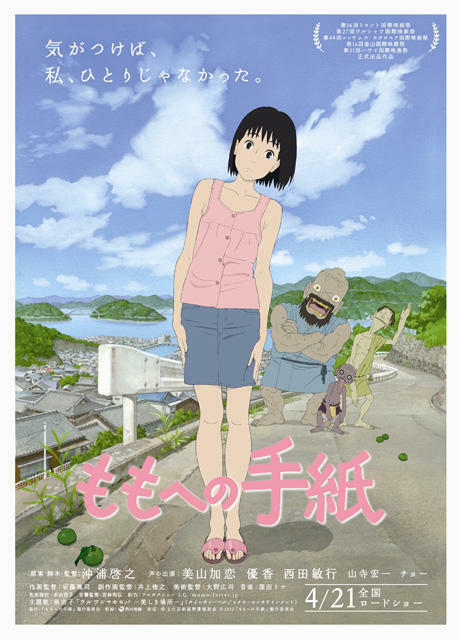 In the film, a young girl named Momo is dealing with the unresolved argument she had with her father right before his untimely death. The dramatic change in her life, and her need to adjust, are made concrete when she and her mother move to the small island of Shio, where her grandparents live. Along for the ride are three spirits on a mysterious mission. Unlike just about everyone else around her, Momo can see them. While this chance encounter with the Otherworld creates (often comical) challenges, it ultimately helps both Momo and her mother heal. One element that intrigues me with A Letter to Momo, and indeed the same element that helps to endear Miyazaki films to me, is the proximity between this world and the spirit world. Set on a rural island, there are scenes at shrines, examples of ancestor veneration, and discussions of Japanese mythology. The spirits, comparable to Irish lore, are neither totally benevolent nor malicious – they simply are. They have their own histories, motivations, biases, and faults. What separates them from the humans they interact with are their powers and Otherworldly jobs. The three take a shining to Momo in part because of how she comes to interact with them – which includes some offerings of food. Less obvious but still there, mixed in with all the modern farming equipment, phones, and Japanese snack foods, are little spirit homes people built once upon a time. One of the major scenes of Momo features an old community tradition in which the families send straw boats with lanterns that they made as offerings into the sea. I’m assuming it is part of the Japanese Obon celebration, a festival for the dead. It’s never really explained – it’s just there, part of the culture. The movie’s purpose is not to explain Japanese customs and beliefs to curious Americans, after all. They just exist, as they have existed in some way for generations, embedded in the story. In watching these films, so full of Japanese customs and folklore, I can’t help but find things to compare to the living fairy faith in Ireland, or think about how things could have been if the Pagan tradition there had not been so altered by Christianity. What can we, as modern Druids, learn from cultures who have living animistic traditions? It’s something to contemplate after watching the film. I highly recommend A Letter to Momo. It’s heartfelt, humorous, and appropriate for the whole family. It would be especially appropriate to watch near Samhain because of the ancestral veneration.